In this part we will explore the meaning of the 46th Shloka of Sri Vishnu Sahasranamam. He is spread out everywhere, present in all objects and beings. He is stable, unmoving and steadfast within who objects like the earth are anchored. He has the final word on every issue and as the Creator of this Universe, He is the final authority on every aspect of the Universe. Bhagavan is the sole Cause for creation and He is the Imperishable seed (Beejam-avyayam). He has great wealth and is the Ultimate goal for men of wisdom. He is complete and self-fulfilled who is a great treasure in Himself. 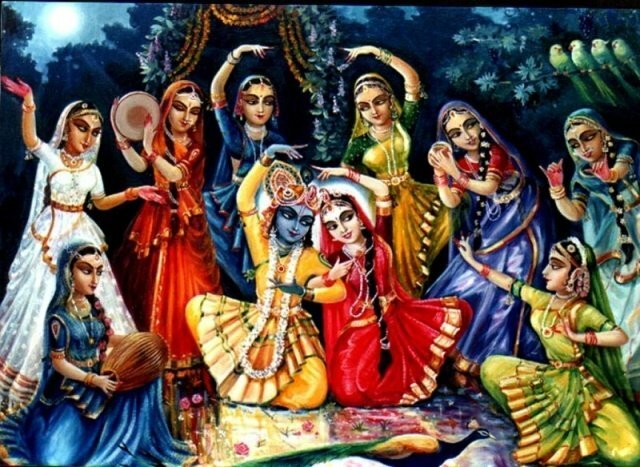 He is the reservoir of supreme joy and a picture of pleasure and enjoyment. He is endowed with immeasurable and unlimited wealth to be given to those who seek Him. Sri Adi Sankara interprets this as ‘Visteeryante samastaani Jaganti asmin iti Vistaarah – All the worlds keep expanding within himself, hence He is called Vistaarah’. One of the fundamental properties of every living being is growth and Bhagavan makes it possible. He himself is changeless but contributes to the growth of everyone else. Sri Satyadevo Vasishtha points out that Bhagavan is Vistaarah because He spreads Himself out in the form of all objects and beings that exist in this Universe. At the time of Pralaya or Deluge, all these will merge back into Him and He expands Himself to absorb all the things. Thus the Nama Vistarah applies both to His being spread out in all objects, and Him expanding to absorb all the objects within Himself. 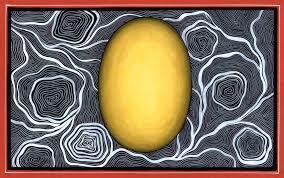 He also gives the example of a seed expanding to a tree, and the tree being contained in the seed back again. The Dharma Chakram writer adds another dimension to this Nama. He observes that Bhagavan’s revelation of Vishvaroopam to Arjuna is an illustration of this Nama. The Vishvaroopam form with infinite faces, infinite eyes, with neither a beginning nor an end, with all the beings, including all the Devas contained in this form, with the Sun and the Moon as His eyes, and with no top, middle or bottom, illustrates His Nama “Vistaarah”. Swami Vivekananda made a statement to the effect that “Life is to expand”, meaning that we get closer and closer to God by expanding our love and desire to reach Him. This is what the Nama “Vistaarah” should remind us. He who is tranquil after establishing the dharma in Krita Yuga. Sri Adi Sankara explains this as ‘Sthitisheelatvaat Sthaavarah; Sthitisheelaani prithivyaadeeni tishthanti asmin iti Sthaanuh; Sthaavarashcha asau Sthaanushcha SthaavaraSthhanuh – He is Sthaavarah-Sthanuh because He is stable, unmoving and steadfast within who objects like the earth are anchored. This type of compounding of two words is called Karma Dhaaraya Samasam in Sanskrit. We have seen a similar double-barrelled name earlier which was ‘ShaashvataSthanuh’ (Nama 120). Sri Parasara Bhattar’s interpretation is “Evam dharme sthaavari_krite, Samey sthaasyati iti Sthaavara-Sthaanuh” meaning He is serene after establishing Dharma in the Krita Yuga. Sri Radhakrishna Shastri explains Sthaavara as referring to the Pancha Bhoothas that will continue till the time of Pralaya and Sthaanuh as referring to someone whose state does not change. He interprets Sthaavara-sthaauh as referring to Bhagavan who does not change in His state, and in whom the changeless Pancha Bhoothas exist. Sri Satyadevo Vasishtha observes that just as the road does not move even though people keep moving on it, like the mother walks but the child in her womb does not walk with her, so also Bhagavan has created all that is around us but He Himself is Sthaavara-Staanuh. T he root from which the Nama is derived is ‘maa maane’ meaning to measure or to compare with. Pramaanam is like a yardstick through which everything is ascertained. In this case it refers to Bhagavan who is the final proof or authority for everything. Sri Adi Sankara explains this as ‘Samvidaatmanaa Pramaanam – He is the expert authority on everything, hence He is called Pramaanam’. He is the final say on every issue and as the Creator of this Universe, He is the final authority on every aspect of the Universe. Sri Satyadevo Vasishtha points out that Bhagavan created this Universe the way He wanted, including the decision on how many species should exist and what attributes they should have, etc., and so He is the Pramaanam or authority for everything. Sri Bhattar interprets the current occurrence as referring to His being the authority to decide what is good and what is bad for the people in the Krita Yuga, after the Kalki Avatar. Sri Radhakrishna Shastri defines Pramaanam as the ability to decide between good and bad through logical analysis using our sense organs (ears, eyes, etc.). Bhagavan is the One who controls this, and so He is Himself Pramaanam. Beejam-avyayam – The Seed Imperishable. Beejam means seed and Avyayam means Imperishable. Sri Parasara Bhattar says that because Bhagavan manifests again and again to re-establish Dharma at the end of each Yuga, hence He is the Imperishable Seed. Sri Adi Sankara interprets this as ‘Anyathaa bhaavavyatih ekena Kaaranam iti Beejamavyayam Savishekam ekam naama – He is the single cause of creating life without Himself undergoing any change, hence He is called Beejamavyayam’. Though it consists of two words it is ‘Savishekam Ekam naama – A single Nama with an adjective as ‘Avyayam’ meaning changeless. Normally the seed turns into a tree and vanishes in the process but Bhagavan is the seed for the Universe but He Himself remains forever without undergoing any change. The Dharma Chakram writer gives a slightly different interpretation – Unlike some seeds which may not produce a tree and which may decay in the form of the seed itself, Bhagavan is the undecaying seed from which the Universe results. Meaning: I am the goal, the Sustainer, the Master, the Witness, the Abode, the Refuge and the dearest friend. I am the Creation and the annihilation, the basis of everything, the resting place and the Imperishable seed. Sri Ramanuja Baashyam for this is “tatra tatra vyaya-rahitam yat Kaaranam tad aham eva” – “I alone am the imperishable seed that is source for the inexhaustible Cause everywhere”. Meaning: That which is equal and indistinguishable in the three genders and numbers as well as in its various declensions. Sri Adi Sankara’s explanation is ‘Sukharoopatvaat sarvaih Arthyate iti Arthah – He is desired or sought after by all since he is the personification of Bliss’. There are four Purusharthas or objectives for all beings, namely, Dharma, Artha, Kama and Moksha. Bhagavan is the single entity encompassing all four of them, hence He is called Arthah. That which is obtained or desired to be obtained is ‘Artha’. Meaning: Thus after innumerable births, one perfected in wisdom understanding fully that the Supreme Lord Vasudeva is the ultimate cause of all causes, surrenders unto Me; such a great soul is very rare. Sri Radhakrishna Shastri remarks that there are many things in this world which are sought after with a view to deriving happiness, but they all end up in resulting in misery after they are acquired and enjoyed. Unlike these, Bhagavan is sought after by those who have gained jnana to know that He is the only one to be sought for permanent bliss. He who is not the goal for some. He who is self-fulfilled and does not have any other end to seek. Sri Adi Sankara interprets this as ’Na vidyate Prayojanam aaptakaamatvaat asya iti Anarthah – he has no possessions because he has no desires and he has achieved all his objectives’. Sri Parasara Bhattar explains that He is not sought after by those who have only a little merit. They seek Him if at all, only for wealth. Those who wish to acquire new wealth, and those who seek the enjoyment of their own self without seeking to realise Him. The Dharma Chakram writer nicely describes how the current-day human being goes to great lengths to make him/her comfortable, and in the process keeps making life miserable. The needs keep rising as more things are desired as existing ones are fulfilled. For example, the moment one gets a house, he/she desires to get a bigger house, then a house in a sought after location, more expensive cars, latest gadgets etc. and the list becomes endless. Even as these desires are fulfilled, there is little happiness or such happiness is transient as new desires creep in. It becomes endless chase giving stress and tension. This Nama illustrates that a life that does not keep multiplying our needs and desires is the life that will ultimately lead us to a mental state where we can contemplate on Bhagavan and enjoy eternal bliss. 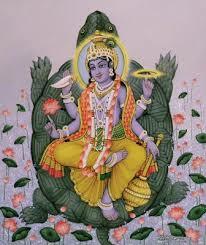 He who is shielded by the five koshas or shields. Sri Adi Sankara explains this as ‘Mahaantah koshaah annamayaadayah Aachchaadakaah asya iti Mahaakoshah – He is covered by many sheaths such as the annamayakosha’. The way to realise Bhagavan is not transparent. There are many layers that the JeevAtma has to overcome and penetrate before realising the Absolute. These layers are 1) Annamaya Kosha 2) Praanamaya Kosha 3) Manomaya Kosha 4) Jnaana maya Kosha and 5) Anandamaya Kosha. Only a true yogi is able to cross all these sheaths and realise the innermost reality which is Bhagavan. Kosha means treasure and Maha-Kosha refers to vast, inexhaustible treasure. Sri Bhattar says that even though Bhagavan is giving away wealth to His devotees in many ways, His wealth does not diminish. Sri V.V. Ramanujan refers us to “Unam il Selvam enko?” pointing to the undiminishing Affluence that is Bhagavan. Sri Satyadevo Vasishtha observes that from this Great Treasure-chest (MahaKoshah) viz. Bhagavan, comes out all these different worlds and the different life-forms in each of these worlds, but the Treasure-chest is not diminished by this. We can observe this in many ways, just like the water in the ocean does not reduce even though it is constantly evaporating. The Dharma Chakram writer points out that by exercising control of our indriyas or senses, we can cross the different Koshas. Anandamaya Kosha by meditating on Self and ultimately realise Bhagavan. Sri Adi Sankara explains this as ‘Mahaan bhogah sukharoopah asya iti Mahaabhogah – He is the reservoir of supreme joy and a picture of pleasure and enjoyment, hence He is Maha-Bhogah’. Meaning: Endowed with a firm faith, when devotees worship their ‘Ishta devata’ and obtain their desires; such blessings are bestowed by Me alone. Meaning: The Lord of the three worlds is sweet as a sugar cube, honey, nectar, milk, fruits and sugarcane. He enjoys His creation endlessly, at all times and becoming His devotee, I don’t have to worry anymore. The Dharma Chakram writer points out that among the joys that one gets, there are those which have desirable benefits, and those that lead to misery as a result of excessive enjoyment. When one eats food for satisfying hunger, it is different from when one eats like a glutton. The latter inevitably leads to poor health and diseases. Similarly, gratifications from gambling, alcoholism, debauchery, etc., are bought at the expense of misery as a consequence. Thus, the Nama MahaBhogah indicates that Bhagavan is the source of bliss that is the greatest of all joys and one that lead to positive benefits and Self-realisation. Meaning: Maharishi Marici, Daksha and others obtained Dharma endlessly. Some have obtained Wealth from Him while others have sought Kama or sensual enjoyment. 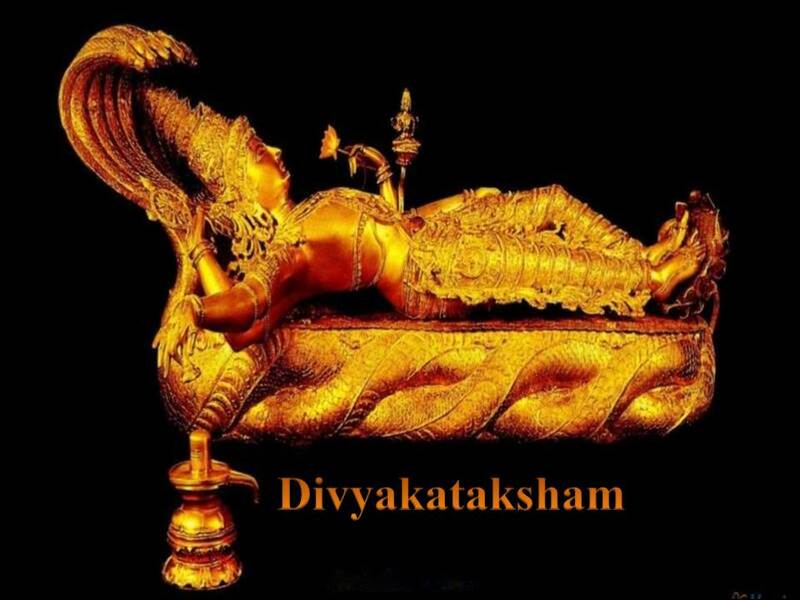 Sri Adi Sankara defines this as ‘Mahat bhogasaadhanalakshanam Dhanam asya iti Mahaadhanah – He is in possession of unlimited wealth as a means to enjoyment’. He is the means of attaining great bliss and from Him all attain great wealth. Meaning: O’Arjuna, the best of Bharatas! There are four kinds of pious men who render devotional service unto Me; the distressed (Arti), the desirers’ of wealth (Artharthi), the knowledge seeker (Jigyasu), and the men of wisdom (gnani). 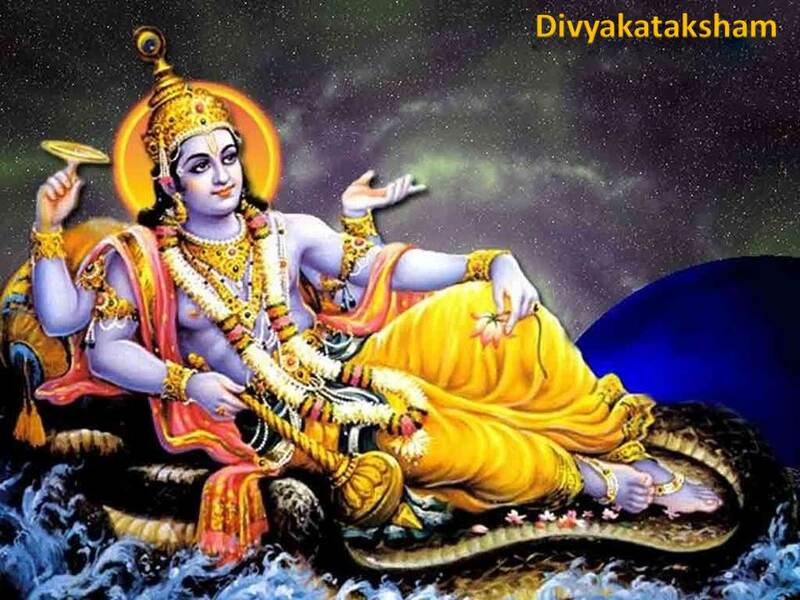 Sri Radhakrishna Shastri points out that He is the possessor of the great wealth that can be kept in the Maha-Kosha – great treasure chest, and that is needed for the MahaBhoga – great enjoyment. The Dharma Chakram writer discusses three kinds of wealth – material wealth, knowledge, and devotion. The first two can be attained by anyone irrespective of their character etc. Those who have material wealth or knowledge are praised by the people of this world, and as a result get intoxicated with pride. But the third category of wealth is rewarded and praised by Bhagavan, and does not lead to anything except Bhagavan Himself. Lord Rama during His Coronation or Pattabhishekam gave away lots of material gifts to the participants, but He did not give any material gift to Hanuman. When Sita Devi asked Rama about this, Rama told her that He has already given Hanuman what nobody else knows, and that she can find out from Hanuman about it. When Sita Devi asked, Hanuman shows Lord Rama and SIta Devi residing in His heart. Sri Satyadevo Vasishtha adds that He is MahaDhanah because He has the wealth that leads to absolute bliss that never diminishes and is immense, which cannot be counted or measured. It is Him that we need to seek for attaining eternal bliss! Tulsidas was a Hindu poet-saint, renowned for his devotion towards Lord Rama. He authored the epic Ramcharitmanas, the Ramayana retold in the vernacular Awadhi. Tulsidas was born to Hulsi and Atmaram Dubey, a Brahmin family, in the year 1532 in Rajapur (Chitrakuta), a village on the banks of river Yamuna in Uttar Pradesh. Tulsidas is believed by many to be a reincarnation of Valmiki. In the Bhavishyottar Purana, Lord Shiva tells Parvati how Valmiki, who got a boon from Hanuman to sing the glory of Rama in vernacular language, will incarnate in the Kali Yuga. Legend goes that Tulsidas was born after being in the womb for 12 months, he had all his 32 teeth at birth, his health and looks were like that of a five-year old boy, and he did not cry at the time of his birth but uttered the name of Rama instead. He was therefore named Rambola (he who uttered Rama). Tulsidas’s birth time was considered inauspicious by the family astrologers who cited immediate danger to the life of the father. Hearing this, the parents abandoned Rambola (Tulsidas) on the fourth night and sent him away with Chuniya, their domestic helper. 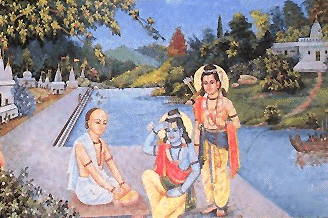 Tulsidas, attests to his abandonment in his works Kavitavali and Vinayapatrika. Chuniya took the child to her village of Haripur and looked after him for five and a half years after which she died. Rambola was left to fend for himself as an impoverished orphan, and wandered from door to door begging for alms. Rambola was given the Virakta Diksha and got the new name, Tulsidas. His Upanayana was performed by the Narharidas at Ayodhya when he was just of 7 years old. He started his first learning at the Ayodhya. He mentioned in his epic the Ramcharitmanas that his Guru narrated him the Ramayana over and over again. He came to the sacred city Varanasi when he was just 15–16 years old and got the knowledge of Sanskrit grammar, Hindu literature and philosophy, the four Vedas, six Vedangas, Jyotisha from his Guru Shesha Sanatana at the Pancaganga Ghat in Varanasi. He got married to Ratnavali (the daughter of Dinbandhu Pathak of Mahewa village) who was a staunch devotee of Rama. Once his wife went to her father’s home when Tulsidas had gone to the temple. Tulsidas was passionately attached to his beautiful wife. Tulsidas stealthily went to see her at night at his father-in-law’s house. This produced a sense of shame in Ratnavali. She admonished Tulsidas and said, “My body is just made of flesh and bones. 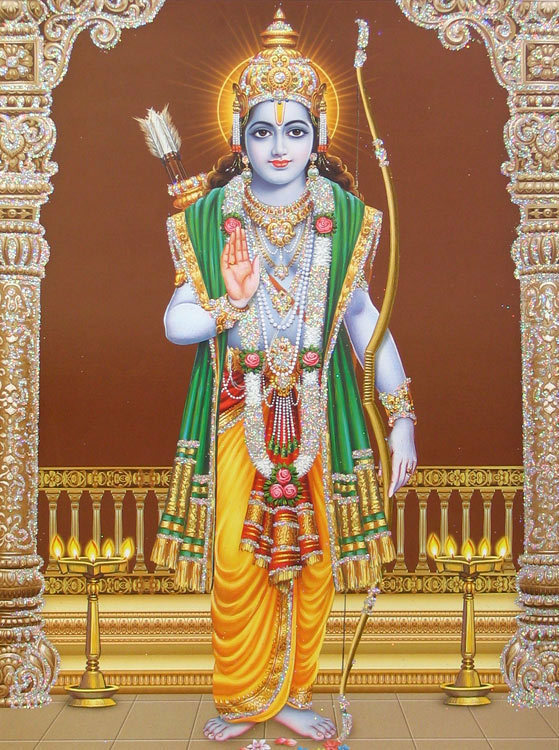 If you would develop even half the love that you have for my body towards Sri Rama, you would certainly cross the ocean of Samsara and attain immortality and eternal bliss”. These words pierced the heart of Tulsidas like an arrow. He did not stay there even for a moment and considered his wife as her first Guru. He abandoned his home and became an ascetic. Tulsidas used to regularly throw the water that was left in his water-pot at the roots of a tree which a spirit was occupying. The spirit was very much pleased with Tulsidas. The spirit said, “O man! I am willing to grant you a boon”. Tulsidas replied, “Let me have Darshan of Sri Ram”. Then the spirit said, “Go to the Hanuman temple. There Hanuman would come in the guise of a leper to hear the Ramayana, he is the first to arrive and the last one to leave. Get hold of him. He will help you”. Accordingly, Tulsidas met Hanuman, and through His grace, had Darshan of Sri Ram. 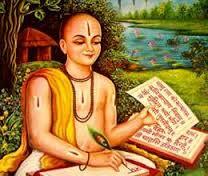 Tulsidas started composing poetry in Sanskrit in Varanasi on the Prahlada Ghat. Tradition holds that all the verses that he composed during the day, would get lost in the night. This happened recurrently for eight days. On the eighth night, Lord Shiva, whose famous Kashi Vishwanath Temple is located in Varanasi, is believed to have instructed Tulsidas in a dream to compose poetry in the local language instead of Sanskrit. Tulsidas woke up and saw both Shiva and Parvati who blessed him. Then Shiva asked Tulsidas to go to Ayodhya and compose poetry in Awadhi. In the Ramcharitmanas, Tulsidas expresses having the Darshan of Lord Shiva and Parvati in both dream and awakened state. Tulsidas came to Varanasi and recited the Ramcharitmanas to Shiva (Vishwanath) and Parvati (Annapurna) at the Kashi Vishwanath Temple. The Brahmins of Varanasi, who were critical of Tulsidas for having rendered the Sanskrit Ramayana in the vernacular dialect, decided to test the worth of the work. A manuscript of the Ramcharitmanas was kept at the bottom of pile of Sanskrit scriptures in the sanctum sanctorum of the Vishwanath temple at night, and the doors of the sanctum sanctorum were locked. In the morning when the doors were opened, the Ramcharitmanas was found at the top of the pile. The words “Satyam Shivam Sundaram” were inscribed on the manuscript. The Brahmins of Varanasi were still not satisfied, and sent two thieves to steal the manuscript. The thieves tried to break into the Ashram of Tulsidas, but were confronted by two handsome guards with bows and arrows. The thieves had a change of heart and came to Tulsidas in the morning to ask who the two guards were. Believing that the two guards could be none other than the great Lord Rama and Lakshmana, Tulsidas was aggrieved to know that they were guarding his home at night. He sent the manuscript of Ramcharitmanas to his friend Rai Todar Mal, the finance minister of Akbar, and donated all his money. The thieves reformed and became devotees of Rama. In another incident, a criminal used to beg every day with the call, ‘’for the love of Ram, give me—a murderer—alms.’’ Hearing the name of Ram, the delighted Tulsidas cheerfully took him inside his house and served him food. This behaviour of Tulsidas infuriated the orthodox Brahmins, who demanded an explanation. Tulsidas told them that the name ‘Ram’ had absolved the person concerned of all his offences. This attitude of Tulsidas incensed the people further. In a fit of anger, they demanded that if the stone idol of Nandi—the sacred bull in the temple of Shiva—would eat grass out of the hands of that murderer, then they would accept that he had been purified. A day was selected for this ritual, and to the consternation of the people, the Nandi idol actually ate from the murderer’s hands. The Brahmins were put to shame. Tulsidas once went to Brindavan, the temple of Sri Krishna. 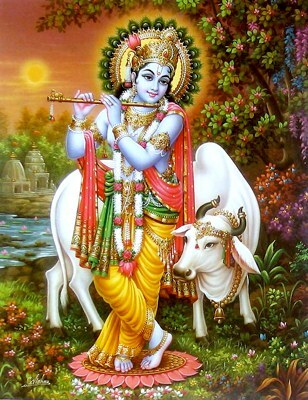 Seeing the statue of Krishna, he said, “How shall I describe Thy beauty, O Lord! But Tulsi will bow his head only when you take up the bow and arrow in your hands”. 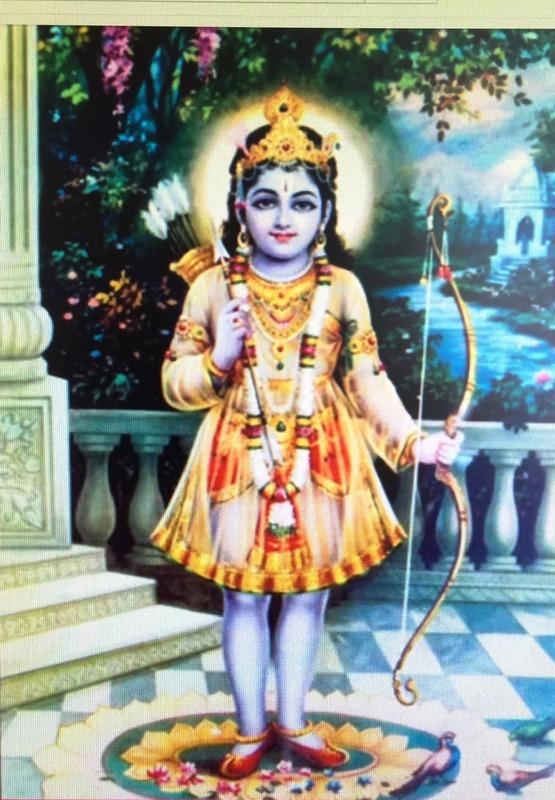 The Lord revealed Himself before Tulsidas in the form of Sri Ram with bow and arrows. It is believed that Tulsidas’s blessings once brought the dead husband of a poor woman back to life. The Moghul Emperor Akbar came to know of this great miracle. The Emperor asked Tulsidas to perform some miracle before him. Tulsidas replied, “I have no superhuman power. I know only the name of Ram”. The Emperor put Tulsidas in prison and said, “I will release you only if you show me a miracle”. Tulsidas prayed to Hanuman and countless number of monkeys entered the Royal Court. The Emperor got frightened and said, “O Saint, forgive me. I know of your greatness now”. He at once released Tulsidas from prison and bowed before him. Vinaya Patrika is a Braja work consisting of 279 hymns. The Tulsi Ghat in Varanasi is named after him. He founded the Sankatmochan Temple dedicated to Lord Hanuman in Varanasi. Bhagavan is the ultimate MahaDhanah that one can aspire for and this Nama and the story of Tulsidas illustrates that He gives away the greatest wealth that can be had i.e., Himself, to His ardent devotees. He is spread out everywhere, present in all objects and beings, so He is Vistaarah. He is known as Sthaavara-Sthaanuh as He is stable, unmoving and steadfast within who objects like the earth are anchored. He has the final word on every issue and as the Creator of this Universe, He is the final authority on every aspect of the Universe, hence He is Pramaanam for everything. Bhagavan is the sole Cause for creation and He is the Imperishable seed i.e., Beejam-avyayam. He is Arthah as He has great wealth and is the Ultimate goal for men of wisdom. He is Anarthah as He is complete and self-fulfilled, who is a great treasure in Himself, hence He is Maha-Koshah. He is the reservoir of supreme joy and a picture of pleasure and enjoyment, hence called Maha-Bhogah. He is endowed with immeasurable and unlimited wealth to be given to those who seek Him and hence He is Maha-Dhanah. Very very interesting commentary. Love the beautiful story of Tulsidas.Your choice of images are apt and well researched.Glad to be part of this. Thank you Rajani ji! God bless you! Hari Om! Very enlightening and engaging commentary. Very brief and your explanations are simple and easy to follow. Thank you sir for offering your efforts and time for a spiritual cause. Can I share this on my wall with your permission sir? Thank you Lakshmi ji! By all means, share! Hari Om Sir! Beautiful story of Tulsidas and pictures. Pranam Guruji! To be honest your description brings back a lot of memories of our late father who was the chief gurukal in Laksmi Narasimha Temple in Shimoga Dist. 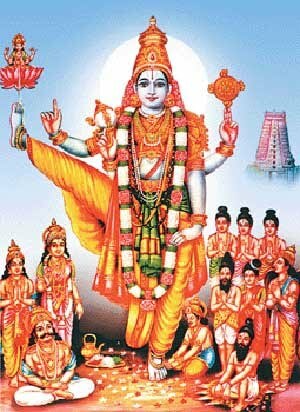 He used to make us attend the community chanting of Vishnu Sahasranama and all the Kalakshepams in the temple complex. He was very ritualistic and we lost interest in prayer and worship as we felt abandoned after his reaching the abode. Now your Vishnu Sahasranama is reviving all that my father spoke about and I shared your link with my two brothers and they too feel the same way. Our family thanks you for re inspiring our faith in Lord Narayana. Thank you Guruji. Our Pranams to you. May Lord Narayana bless your family! Hari Om! You are welcome Nagarathna ji! God bless you. Hari Om! Thank you Sreeram ji! God bless you! Hari Om! Thank youVighnesh ji! God bless you! Hari Om! Greetings sir! Divine commentary! Fantastic story. I read it regularly now. Praying for divine intervention. Hope god blesses me. Thank you Sowjanya! Great to know that you are a regular now. God bless you! Hari Om! Divine narration sir. Thank you so much. God bless! Hari Om! Reading your blog is an absolute bliss and kindles hope that we too can make an attempt to lead a life filled with devotion. The story of Tulsidas is an added bonus and reiterates our faith. My humble thanks for this great work and sharing with all of us. Thank you Gowri! In fact I make it a point to narrate at least one story per blog to reinforce the power of Bhakti. HARI OM SIR! Goosebumps while reading from your blog. Early morning to read about the Lord makes the day divine sir. Thank you sir. Hari Om Sir! Koti Punyam to you. It is a very blissful read. Only that sometimes samsara stress does not allow us to read your blog the moment we are notified. Since its evening hour was happy to go through it. Thank you sir. Keep posting. A thumbs up to you. Thank you Shobana ji! Please try to read regularly and your stress of Samsara will vanish 🙂 God bless you! Hari Om! This Nama Vistaarah reminds us that we should pray to god and change ourself as it is the last yuga. 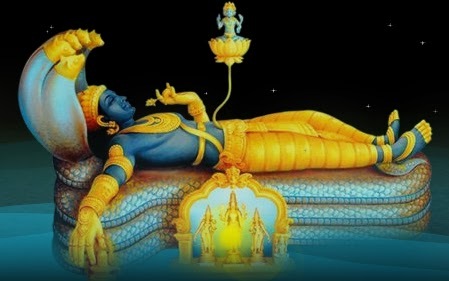 Maha Vishnu appeared as Matsya, Koorma, Varaaha and Narasimha in Kritha Yuga. 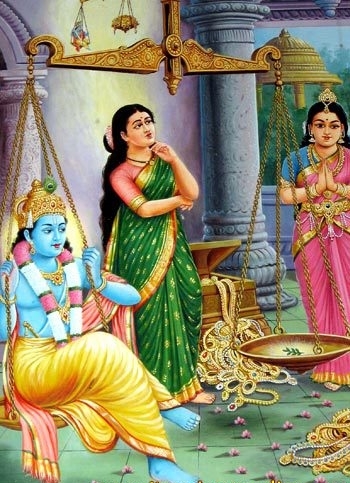 Vaamana, Parasuraama and Sri Rama in Treta Yuga. Kalki Avathar in Kali Yuga which will end all yugas. He will have mercy on people who do good and pray to him. Balaji Uncle sorry if the spelling is wrong. We learn more in sanskrit. Thank you both Uncle. Hari OM! The only small mistake in your spelling is ‘Namosthvanathaaya’ has been spelt as ‘Namosthvandaya’. He is Anantha meaning the Endless One. This shloka from the Phalashruti is a beautiful one conveying the grandeur of Bhagavan. Sorry I have myself made a mistake. It is actually Namostu + Ananthaaya becoming Namosthvananthaaya. I missed out the ‘n’. This is also a shloka in GargaSamhita. Thanks to Shambavi I made this discovery! Thank you Shambavi! Kalyug has 432,000 years and we have just completed 5000 years. So we have a long way to go before the Yuga finished and Pralaya sets in! Nice Shloka from Phala Shruti! God bless you! Hari Om!